In factory power plants, energy is produced from the by-products of the production process. This combustion process in turn creates its own by-product, which can be re-utilised. Bio fly ash has previously been disposed of in landfills or used in ground construction, meaning that the valuable nutrients in it are lost. Nature’s own cycle of nutrients is broken. Combined with today’s effective harvesting and clearing away of forestry and stumps, this means that biomass is not left to decompose in forests like it once was. Fertilising using ash fertiliser returns balance to the natural cycle of biomass and nutrients. Using bio ash fertiliser is not only good for the environment; it is also one of the most profitable investments for forest owners and forestry companies. Biomass growth will increase, the quality of the wood will improve and rapid growth means that the forest can be thinned sooner. Opportunities for making use of ash are now available. We help the forestry industry to turn by-product into viable, sustainable business. 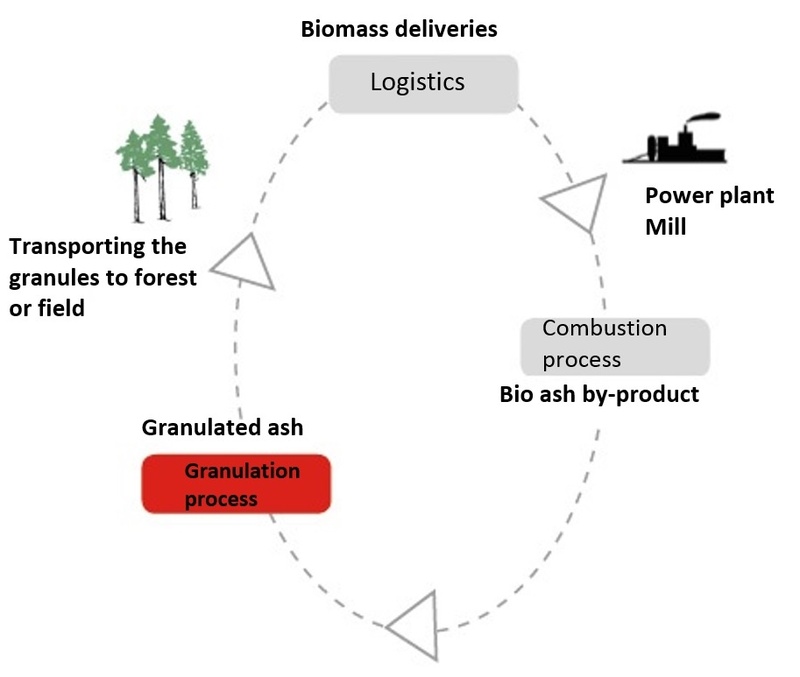 Productising ash is not simply the granulation of bio fly ash; it is a series of stages through which bio ash becomes a commercially saleable product that ends up fertilising forests. Tightening environmental requirements and laws require also the forestry industry to re-use and recycle by-products of the combustion processes. Disposing of ash in landfill sites is no longer a viable option. By productising the granular ash and selling it as fertiliser to the same forest owners who supply raw material for manufacturing, costs are turned into revenue. Fly ash fertiliser is competitive in price and function compared to industrially produced forest fertilisers. Ash granule fertiliser is created locally for local customers. Sustainability and environmental values can be practiced by using re-using bio ash as forest fertiliser. The environment benefits when less waste ends up in landfill sites and nutrients are returned to the environment from which they came. The granulation of bio fly ash and the entire distribution chain creates new employment opportunities for local people. Forest owners can fertilise their forests using ash from their own wood, which is better quality and has longer-lasting effect than equivalent industrially-produced forest fertiliser. The forestry industry has shown responsibility in environmental matters. Using nutrient-rich by-product for the good of the forest adds market value and positive publicity. Tecwill’s granulator systems can be situated in the immediate vicinity of factory power plants. The fly ash is fed from the ash silos into the special mixer using screw conveyors. The ash is mixed with water according to the prescribed recipe, creating a suitable mixture. The moist ash mix is fed into the granulator disc, where granulation occurs as a continuous process. Ash granules can also be fortified with additional nutrients or other nutrient-rich by-products, if required. A suitable composition of added nutrients can be determined according to the composition of the ground to be fertilised. Once formed, the ready granules are transported by conveyor belt to an interim store, transport container or a packing station, ready for the next stage.